This month we’re featuring tools for project/task management and mobile communication. As always, our featured tools will cover a broad range of uses - from managing social media campaigns to collecting online donations. Many were not developed exclusively for nonprofits, but all are selected based on their usefulness, ease of use and cost (most, if not all, will have a free version...). Asana – Improve the way teams communicate and collaborate. Overview: Staff members’ e-mail inboxes and weekly status meetings are not the only places where project management should occur. Asana is a web application designed to organize tasks and then assign them to projects and people. Nonprofits often think of “capacity building” in terms of expanding or scaling, rather than greater project management efficiency. Not only can this free up critical staff bandwidth, but it also helps institutionalize all of the plans, processes and tasks. Asana addresses the problem that many nonprofits have with being unable to deconstruct projects or new initiatives into manageable tasks. While I am a big fan of many other project management tools (e.g., Basecamp, Trello), Asana seems to be the most intuitive option, and it does not include any distracting bells and whistles. Cost: Asana is free for up to 30 users, after which plans start at $100 per month. Potential Uses: Project management, staff training, intern management, process documentation. Gather – Communicate via text message with your MailChimp subscribers. Overview: Gather is a simple tool for communicating with your MailChimp subscribers via text message at an event. Once you create a simple web/mobile form, individuals can sign up and choose to be added to your MailChimp contact list if they are not already. Subscribers' numbers cannot be seen by the account administrator and are deleted after the event ends. And don’t worry – MailChimp provides the administrator with a phone number to use so your personal one is kept private. Once individuals have subscribed, you can communicate both with the entire group and with individual contacts. There are plenty of tools available for organizations to communicate with attendees before and after an event (e.g., Eventbrite, SurveyMonkey). Few, however, make it easy to communicate via text message during an event (let alone sync with your MailChimp account!). Cost: $8.99 for 175 messages, $18.99 for 500 messages, and 2,000 for $48.99. Looking to re-vamp your resume? You can register for our upcoming Resume Workshop on February 19, where you can hear from our panel of experts on how to make sure your resume stands out to hiring managers. Register today! Resumes are an important part of any professional's career. It’s the one page where you can showcase our previous experiences, accomplishments, skills, etc. However, with most human resource and hiring managers having a small window of time to actually review your resume, how are you able to really make your accomplishments stand out? Standard formatting Resumes should be clean in presentation, so don’t get too crazy trying to bold, italicize, underline and adjust the font size and type of every line in your one page. Have one standard font throughout the resume (Arial or Times New Roman are good ones to use) and have at most two varying font sizes (10 pt or 12 pt is standard). Also, limit your bold texts to headlines. Your document margins should be either .5” or 1” around. Keywords Review the job description and make sure you highlight the keywords that are present throughout the responsibilities and required previous experience sections. Hiring managers will be looking for specific skill sets and prior work experiences related to the open position. Highlight Accomplishments Don’t be shy about what you’ve done since your resume is where you can showcase why you’re the best candidate for the job. Applicants tend to list what their organization has done and not what they themselves did in their current position. Highlight YOUR work first and foremost! Relevant Volunteer Experiences With nonprofits, highlighting your relevant volunteer experiences and causes you support will stand out to hiring managers. They want to see that you are engaged with the nonprofit sector and are active in causes outside of your work and school experiences. Also, with the job market down, showcasing that you stayed active in learning and training through volunteering and interning can make you stand out among the other applicants. What other resume tips would you add to the list? Share with us in the comments below, and join us tomorrow at our Resume Workshop! “I can’t lobby, I’m a Nonprofit!” Myths dispelled! Many seasoned nonprofit professionals are not well-informed about the legalities of lobbying and advocacy. There is a general fear of losing one’s 501(c)(3) status and therefore an unwillingness to engage in any type of political activity whatsoever. This misguided reluctance is causing our sector as a whole to waste opportunities to sit at the policy-making table. Firstly, there is a large and important difference between advocacy and lobbying. Advocacy is educating people about an issue or topic. Direct lobbying, as defined by the IRS, is communicating with a legislator about a specific piece of legislation. Grassroots lobbying is defined as communicating with the general public and encouraging them to contact legislators and lobby them about a specific piece of legislation. Taking a stand on an issue in your e-mail newsletter: NOT lobbying. As you can see, nonprofits can engage in a wide range of political activity without even venturing into lobbying territory. But to dispel another myth – nonprofits are ALLOWED BY LAW to engage in lobbying. Without doing anything, a nonprofit can expend up to 5% of its resources on direct or grassroots lobbying and be in NO DANGER of losing 501(c)(3) status. One thing that 501(c)(3) nonprofits cannot do, ever, is engage in campaigning for candidates. You are never allowed, as an organization, to endorse one candidate or group of candidates over another during a campaign. A nonprofit is allowed to host a debate featuring the candidates, but all candidates for the office need to be invited. A nonprofit IS allowed to take a public stand on an issue in an election (such as a proposed amendment or resolution), just not on a person or a political party. As a Board Member of the Georgia Arts Network, I created a handout with advocacy/lobbying tips for the recent Georgia Arts Advocacy Day, held at the State Capitol on January 29. The tips are relevant for anyone engaged in advocacy, so I am sharing that document here. I hope this post has been useful. Please comment with your thoughts, other good advocacy resources, or your questions! A new year means new conferences to attend in 2013. Here’s our shortlist of ones happening in Atlanta and neighboring states in the South, taken from SocialBrite’s Calendar of 2013 nonprofit and social change conferences. 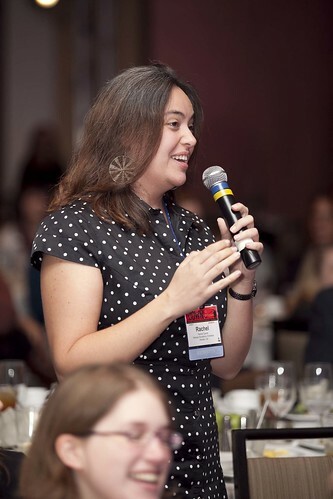 For young professionals in the nonprofit sector, attending these conferences could be of great benefit to both your organization and your own personal professional development. Check out the list below and let us know on Facebook or Twitter which ones you plan on attending. Is your organization putting together a conference in the South, or did we miss one coming up in 2013? Let us know in the comments below! Looking Back on 2012 . . . and Towards 2013! When I think about all we accomplished in 2012 at YNPN Atlanta, it's a little mind boggling. For such a young organization, we have seen huge growth in our membership and programs! As we move forward into 2013, I wanted to take a moment and reflect on the awesome work our Board of Directors, committee participants and members have accomplished. We launched our paid membership structure at the end of 2011, and since then we've had tremendous growth. Many YNPN chapters feel confident in launching paid memberships until the day they start their first renewal cycle and have a very hard time retaining members. Not only did you renew your memberships, but we saw an increase! We are currently at 56 paid members, and we're growing monthly. We took our mailing list from about 100 people to more than 375. Not too shabby! The number one thing that our members requested we add to our offerings was the opportunity to work with a mentor in the nonprofit sector. Ask and ye shall receive! In October we launched our Mentorship Program, which has paired 16 YNPN Atlanta members with mid- to executive-level professionals in our field. We kicked off the program with our Value of Mentorship event and heard from a fantastic keynote speaker, Patricia M. Falotico (Vice President, Global Sales Center Transformation, IBM) on some of the highlights and pitfalls of her mentoring relationships from the perspective of mentor AND mentee. Some of our members celebrating 2012 at our Holiday Happy Hour! YNPN Atlanta sees an effective, viable and inclusive nonprofit sector in metro Atlanta that engages young professionals as an integral part of the nonprofit community, supporting those individuals in their growth and future leadership. We need YOU to succeed in our mission! We need you to attend our events, join our committees, and spread the word that YNPN Atlanta is a valuable resource to the nonprofits in our community. We are the next generation of leaders in Atlanta, and through the relationships and training offered by YNPN Atlanta you will be prepared to take your seat at the executive table! On behalf of the YNPN Atlanta Board of Directors, thank you for your commitment to our chapter. We look forward to more exciting opportunities in 2013! Overview: Present.me is an online communication tool that lets you pair video/audio content alongside your presentation. Many different types of documents can be uploaded to create a Present.me, including Power Points, PDFs and Word documents. Once a document is uploaded, the user records (webcam required) the presentation and can easily trim/re-record segments. Once finalized, it can be downloaded, shared online and embedded in other webpages. Cost: The basic plan is free. Advanced plans that include unlimited presentations and privacy options range up to $49 per month. Potential Uses: Board presentations, volunteer orientation, staff training. Overview: Double the Donation is an online service that makes capitalizing on corporate matching gift programs much more convenient for organizations. Many in the nonprofit sector, even those in development, fail to realize how many potential donors work at companies that offer matching gift programs. Additionally, many employees at these companies are either unaware of their company’s matching program or cannot easily access the pertinent information and forms to participate. Double the Donation aims to address both challenges by providing organizations with customizable web pages that feature its searchable matching program database which it actively manages and updates. Cost: Pricing begins at $240 per year and increases based on the organization’s number of donors/volunteers. Potential Uses: Set up a matching gift landing page for your site and highlight participating companies' specific cities. Overview: Mobile Roadie makes it easy to establish a mobile presence without any knowledge of web design or development (i.e., no coding is required!). Organizations that may not have the resources or expertise to create a mobile site or app now have a powerful tool to do so. Users can create custom mobile sites as well as iPhone/Droid/iPad apps using Mobile Roadie’s expansive suite of style options (icon sets included!) and features including push notifications, user badges, pop-up videos and e-commerce, among many others. Mobile Roadie’s platform can also be integrated with other online sources where your content may already exist, including Facebook, Twitter, Instagram, YouTube, Eventbrite, Flickr and Foursquare. Once your app is complete, Mobile Roadie will also help guide you through app submission process. Cost: Pricing is based on platform: mobile site is free, iPhone app is $99 per month, and iPad app is $299 per month. Potential Uses: Permanent mobile presence (San Diego Zoo case study), targeted advocacy/marketing/fundraising campaigns, self-guided tours, conferences and events (Midem case study). Dear Mr/Ms. ________, Thank you for interviewing with our company. The selection process was very competitive, and it was difficult selecting the right person with so many qualified applicants. UNFORTUNATELY…. • Breathe! – Take a deep breath and let the reality settle in. It can be a hard pill to swallow and discouraging to know that you didn’t get the dream position. Most importantly, REFRAIN from posting any negative comments on social media about the organization turning you down. As perfect as you may have seen the job, know that the decision was made with the assumption of what was best for both parties’ current situation. There’s definitely something even better awaiting you in the near future! • Reply Politely – Like sending a thank you note after your interview, send a quick thank you e-mail letting the organization know how you appreciated their time in considering you for the position. Wish them well with the other candidate and highlight a lesson you may have learned from the interview process. Your reply can help to build a bridge between you and the organization beyond the application process. • Ask for Feedback – Within your thank you note, ask for feedback about how you did during the interview process. You'll learn about what you did well and what you can improve on. Since you didn’t get the position, you really don’t have anything to lose from the question, and it shows that you are invested in improving professionally. • Keep in Touch – At the end of the note, mention that you’re interested in future openings and opportunities with the organization. If it’s a nonprofit, see if they have volunteer opportunities that you can help with – maybe within the department that you were applying for. This gesture shows that you’re still invested in the mission of the organization and in your own personal professional development. • Continue Applying! - As we know in the nonprofit sector, things can shift quickly within organizations, so it’s important to not “put all your eggs in one basket,” no matter how appealing that “dream job” was. There may have been other factors within the organization that may not have suited your working style, or the position already had an internal application considered. No matter the case, continue seeking positions, and don’t get discouraged by the rejection. Seek opportunities for growth in the application process and know that you WILL find that dream job! Happy hunting, and may the odds be ever in your favor! We are so thrilled to announce that at the YNPN Atlanta Holiday Happy Hour & ACFB Food Drive our members and friends donated more than 80 pounds of food to the Atlanta Community Food Bank. That’s enough to serve about 100 meals! Thank you so much to all of those who joined us and for your generous donations! We had such a great time seeing old friends, welcoming new friends and toasting to our successes this year. We hope to see you all again soon, and until then, Happy Holidays! Overview: Litmus is an online tool that lets you test your e-mail campaigns in 30+ e-mail clients and devices. Many nonprofits rely heavily on HTML e-mail campaigns for fundraising, volunteer engagement and newsletters. Litmus ensures that the recipients of your e-mails view them exactly how you intended. Major e-mail marketing services (e.g, MailChimp, Constant Contact, ExacTarget) have come a long way in terms of ensuring end-user e-mail client compatibility, though Litmus does a much more thorough job. If you are unsure whether this tool would be useful for your HTML e-mails, just test it out for free on the Litmus website. The monthly cost may seem steep, but you may only need it for several months, and when you consider the implications of a successful (or unsuccessful) marketing campaign, it may be a steal for your nonprofit! Cost: Basic plan begins at $49/month and increases with features up to $299/per month. Potential Uses: One-time use to test HTML templates or ongoing testing for e-mail marketing campaigns. Overview: Chartbeat provides you with real-time dashboards for your key website and social media analytics. The best way to understand Chartbeat is simply to spend a few minutes exploring the demo dashboards. Using Chartbeat can save any nonprofit, especially those without a dedicated social media manager, a tremendous amount of time tracking and analyzing data from multiple online channels. Unfortunately many nonprofits spend too little or too much time gathering website and social media data. Chartbeat helps shift the focus from gathering your data to actually using it to drive tangible decisions. Cost: Base plan is $9.95/month and includes 5 websites and 2 administrator accounts. Potential Uses: Actively monitor and analyze website/social media metrics, screenshots for report deliverables. Overview: SupporterWall is an online crowdfunding tool that lets you showcase donors in an interactive grid. There are many fundraising and crowdfunding tools available, though few let you showcase donors in anything beyond a simple list. SupporterWall lets you customize the number, size and funding level of each square as well as the image (e.g., a logo, ribbon) before launching your campaign. The interactive wall can be easily shared via social media as well as embedded in web pages. Cost: You can either choose an upfront $49 fee or a 6% fee on all funds raised. Potential Uses: Grassroots fundraising for specific projects where visibility is a high priority. 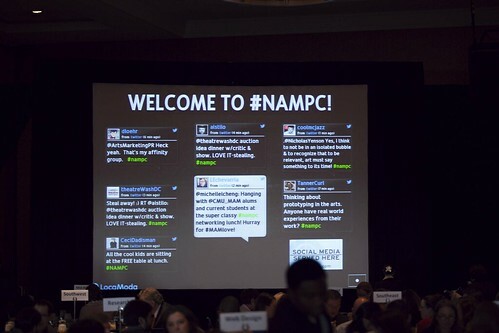 A few weeks ago, I attended the National Arts Marketing Project Conference (NAMPC) in Charlotte, North Carolina. I was there representing both the Georgia Symphony (I’m their Director of Community Engagement) and the Georgia Arts Network (I serve on their Board as the Marketing Chair). NAMPC is an annual event organized by Americans for the Arts. I can categorically say that it was the best conference I have ever had the pleasure to attend! I learned SO much, met incredible people, and had a ton of fun to boot! Here’s a photo of me asking her what designer she is wearing (I also had a “real” question!). Photo by George Hendricks. It’s really inspiring! Nina runs a museum in California and her blog, Museum 2.0, has begun a revolution in the industry. Her tactics for engaging with the constituency are something which can be applied across many nonprofit disciplines. Adam wondered if this technique could be used for fundraising. If someone visits your donation or membership page, couldn’t they be shown an ad exhorting them to donate/join as they visit other sites around the web? It serves as a nudge and a reminder. I thought this idea was fascinating! Objective – Why does the brand change matter? Where will it lead? Leadership – The top person at the organization must be leading the charge for re-branding. Commitment – Be prepared for change and set expectations for the change. Stakeholders – Get everyone on board; socialize your ideas. Process – Expect the unexpected throughout. Resistance – Be prepared for skeptics, both internal and external. Support – Find partners and allies in the process. Wholeness – Connection across the organization is critical. Measurement – Metrics do matter! This tied in well with the final keynote of the conference from author and marketing guru Rohit Bhargava, who exhorted the crowd to work on humanizing your organization's brand. Here are his top tips! Tell the Truth – By letting your audience behind the scenes of the organization. Share your "outtakes." Connect People – Make connections with your influencers. Offer an Emotional Story – Ex: You can dramatize your backstory. Live Your Personality – Don’t be shy, and celebrate your quirks! You can see Rohit's full presentation on the conference website. If you work for an arts or cultural organization, I highly recommend attending the NAMP Conferences in the future. Next year's will take place on November 8-11th in Portland, OR. I will be there! Will you?